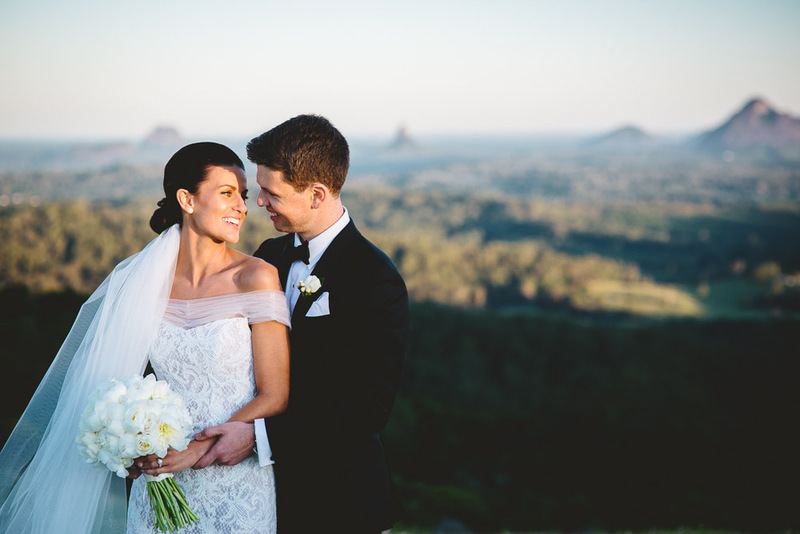 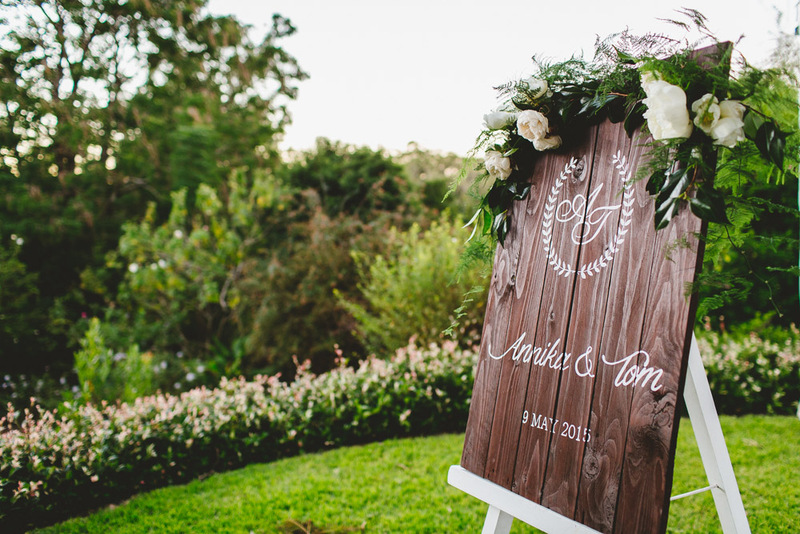 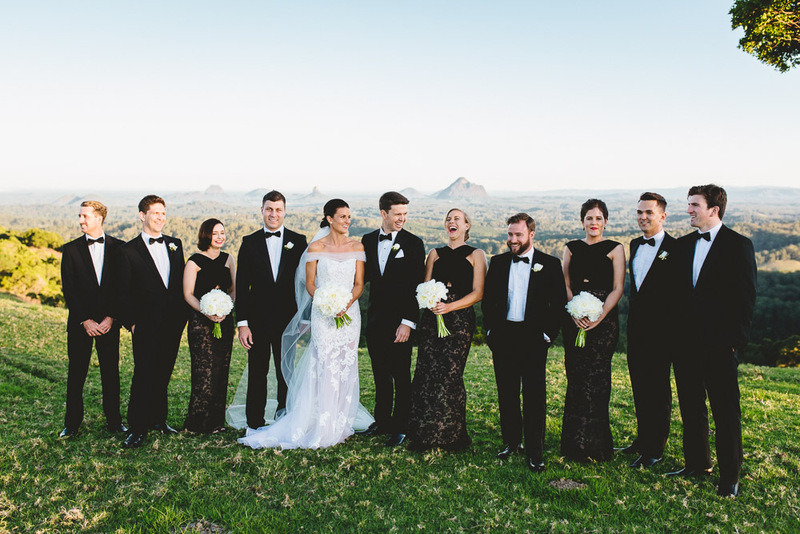 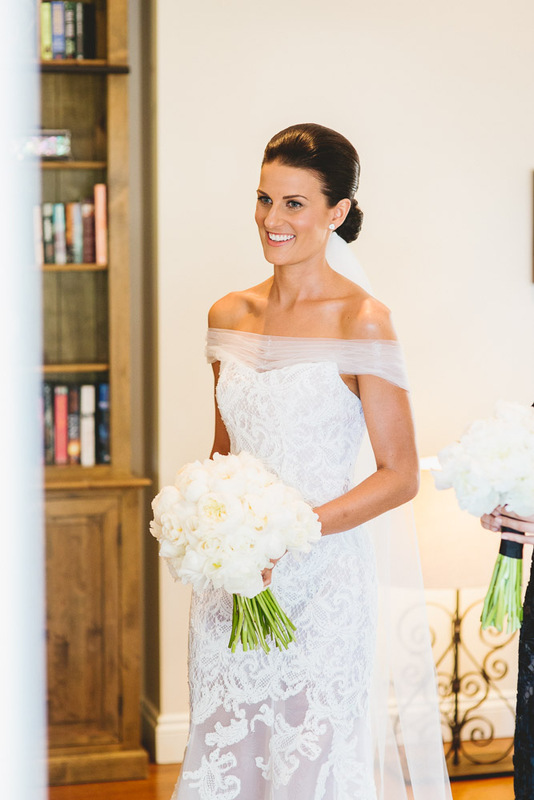 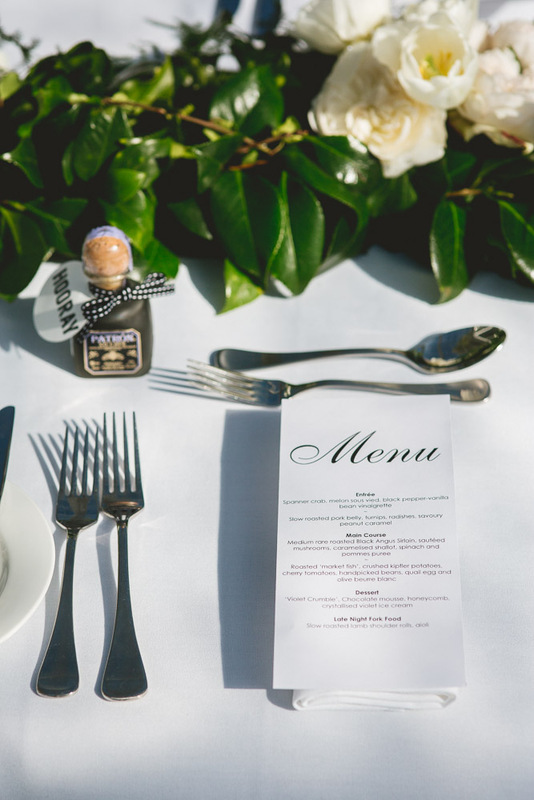 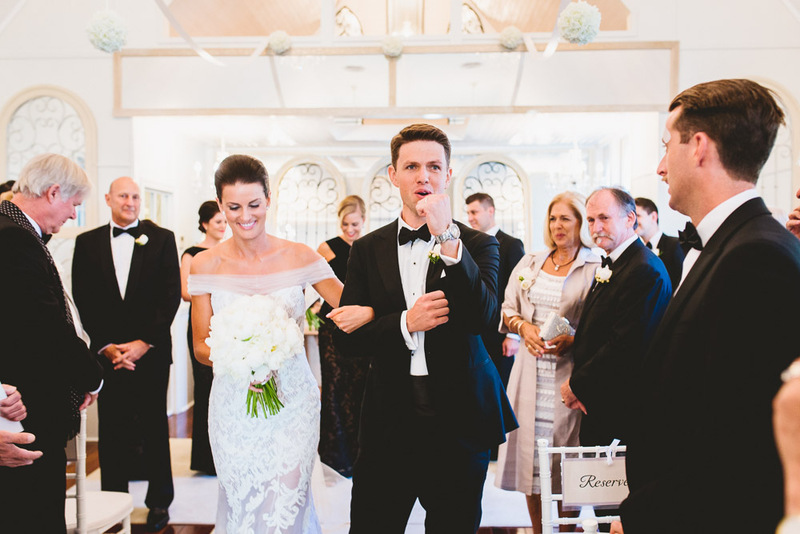 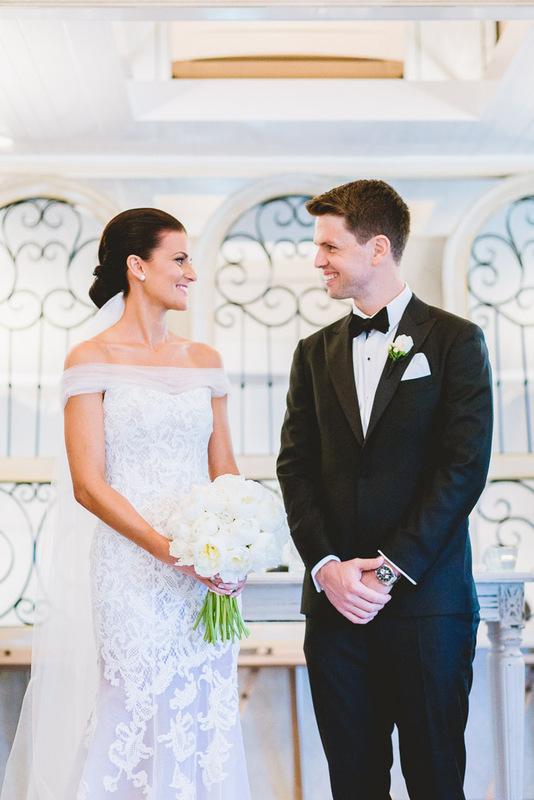 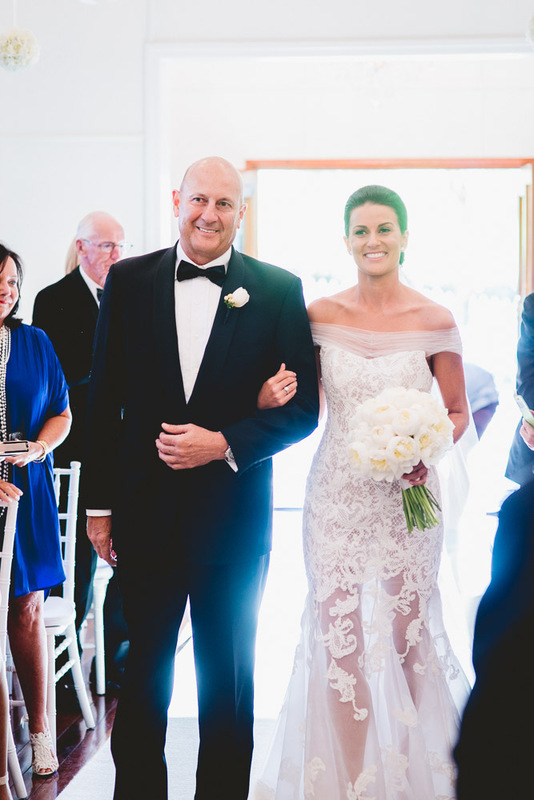 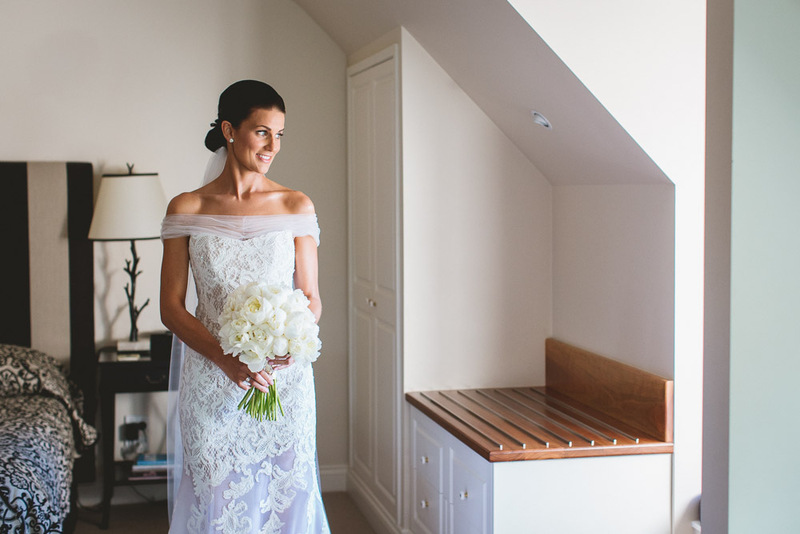 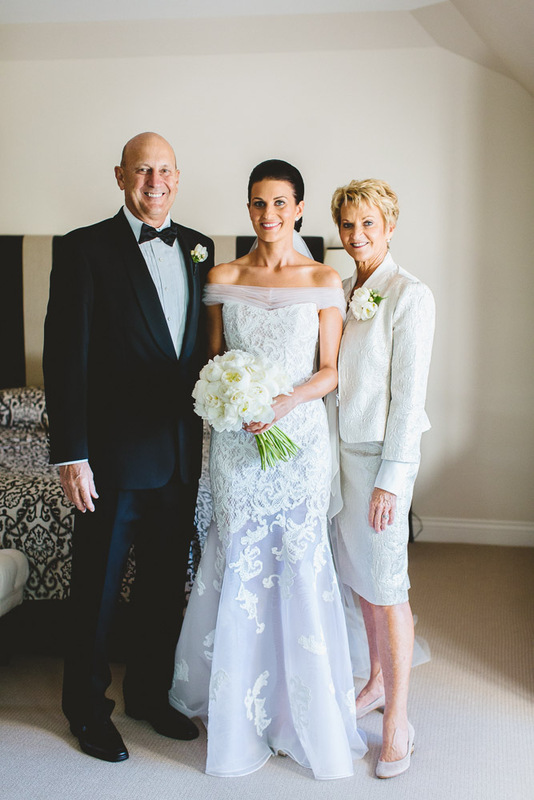 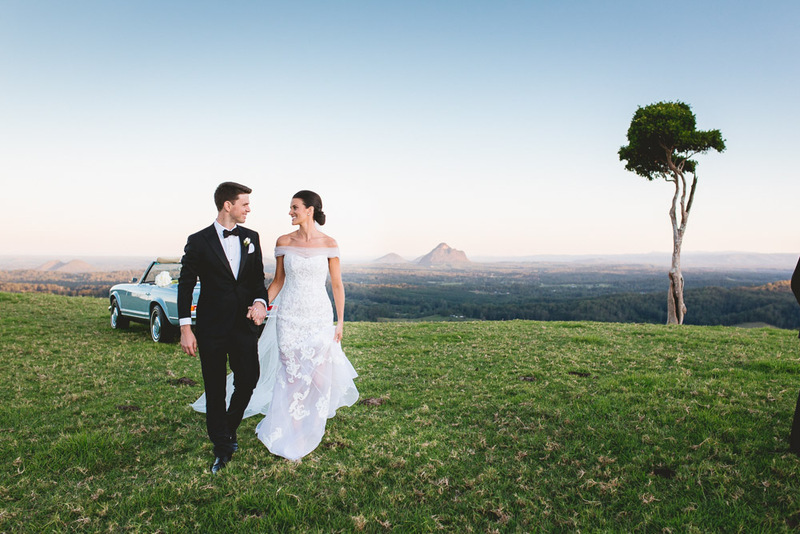 Annika and Tom celebrated their beautiful wedding day at Spicers Clovelly Estate it was a gorgeous Autumn day with beautiful blue skies and stunning sunshine and with such a sophisticated wedding concept this opulant celebration was always going to be a glamorous affair. 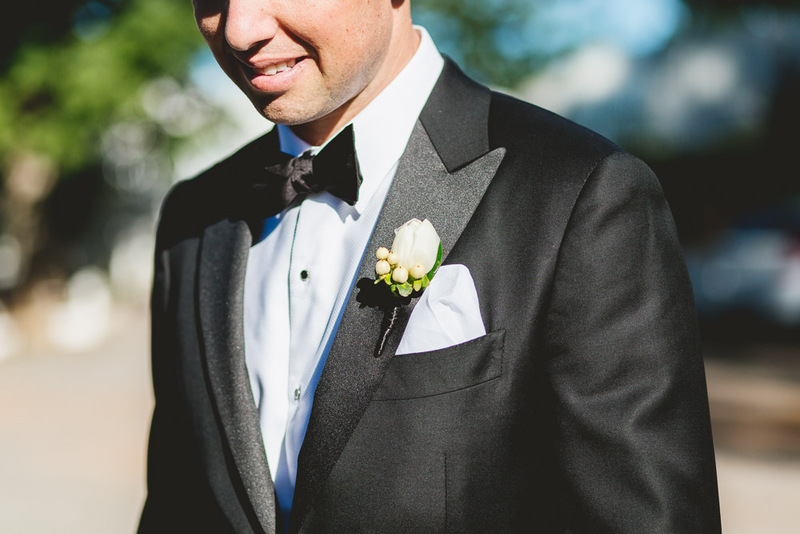 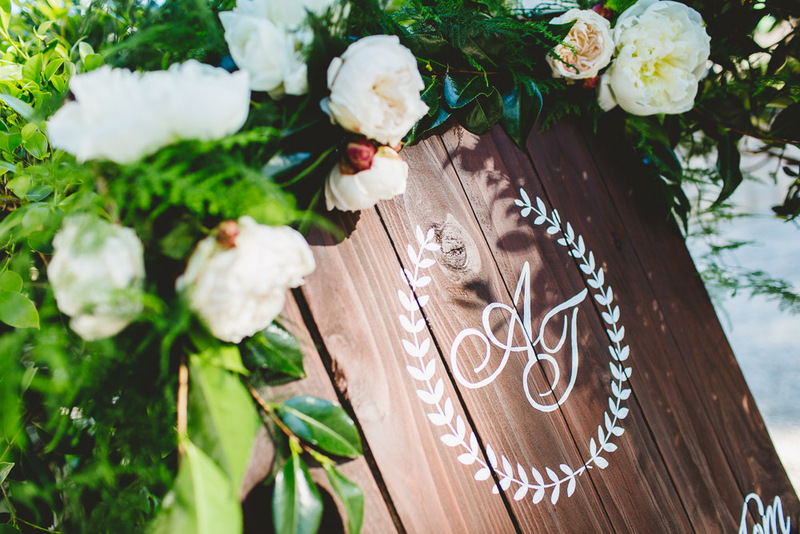 Marquee wedding flowers featured for this decadent day and we loved creating the French country wedding flowers brief which featured a black and white styling concept and an elegant floral concept highlighting white peonies imported from France and beautiful David Austin roses to add that sweet gardenesque floral feel, the white and ivory florals accented the elegant wedding space wonderfully, and added the required sophistication to the style of the day. 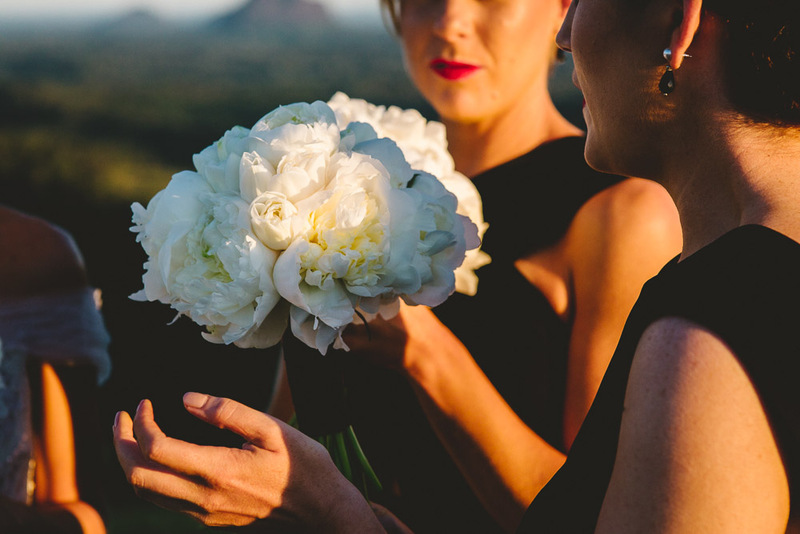 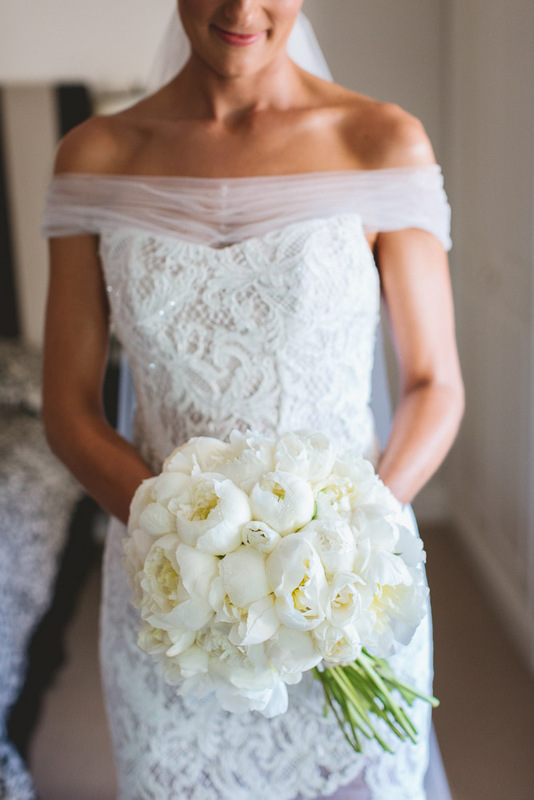 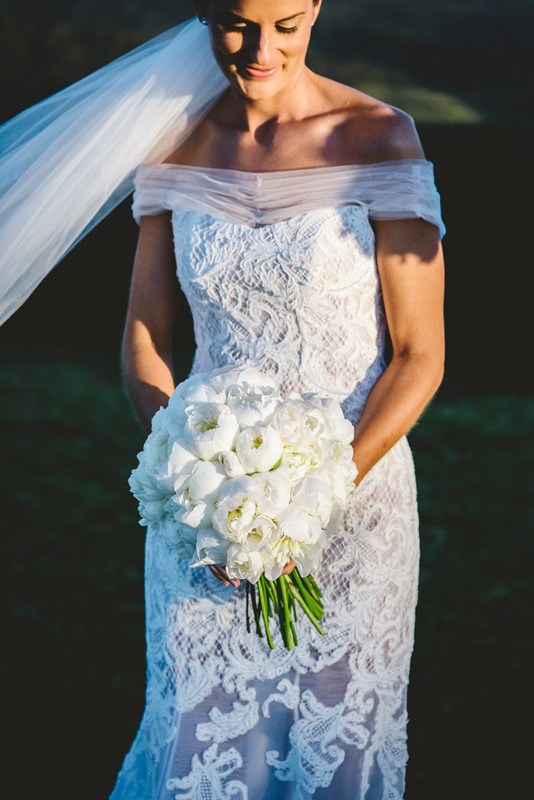 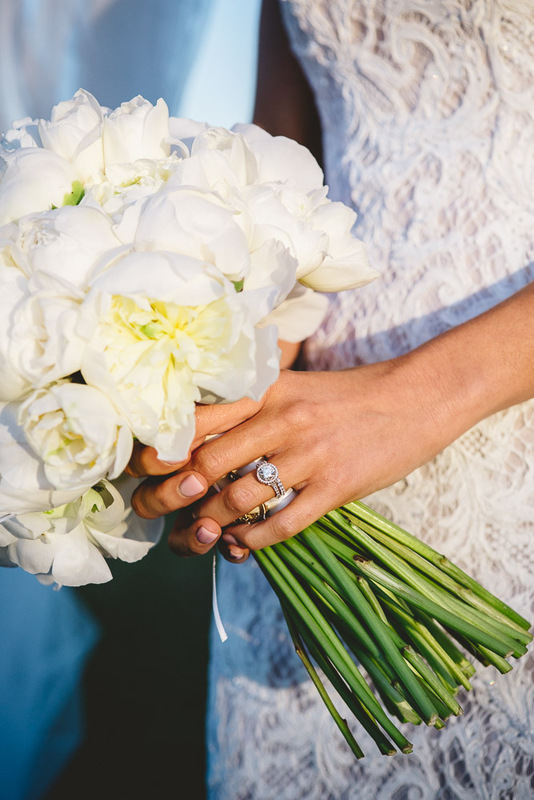 Annika’s bouquet featured all white peonies, and we souced these from France and the fluffy gorgeous blooms were the beautiful accessory to her gorgeous gown, and her bridesmaids carried smaller versions of her design. 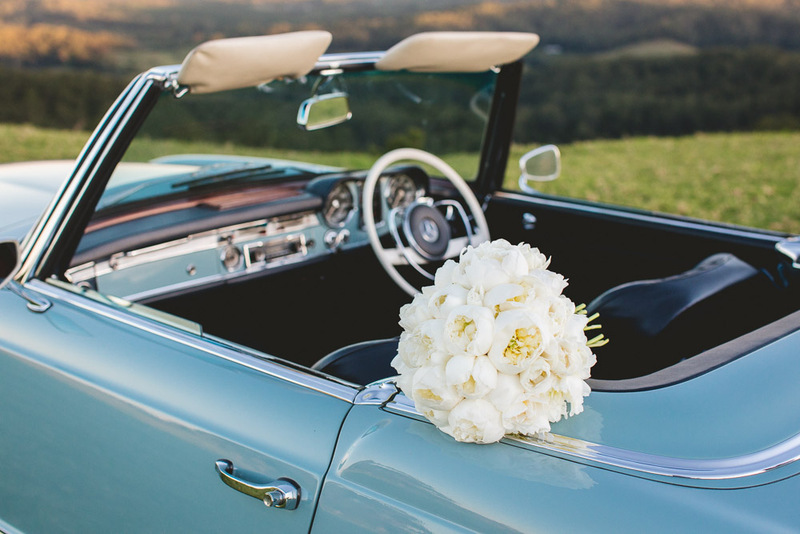 The couple said ‘I Do’ at The Little White Wedding Church and the bridal party exited the ceremony in style, and as you can see from the vintage Mercedes that Annika and Tom left in as Mr and Mrs, it was quite the sophisticated transit and a perfect fit for their gorgeous day. 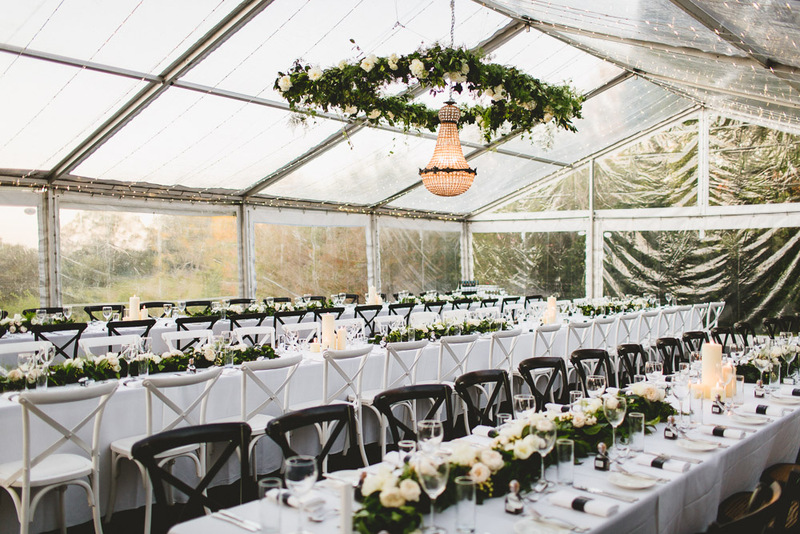 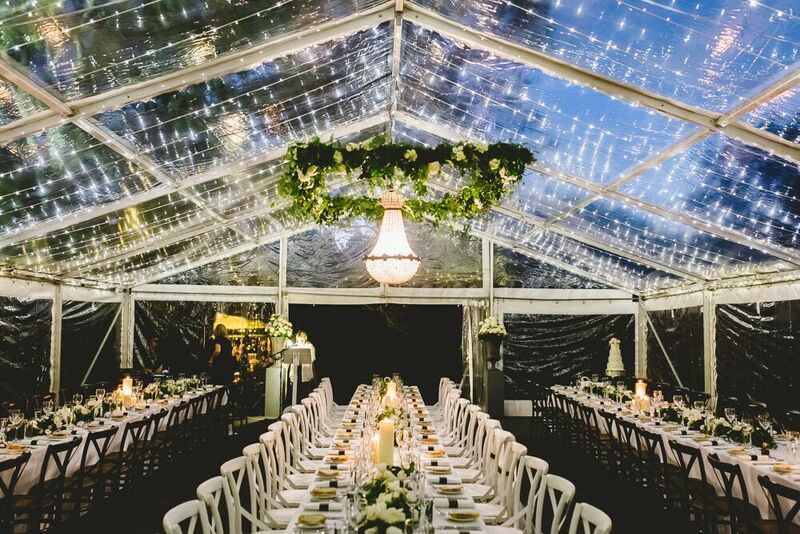 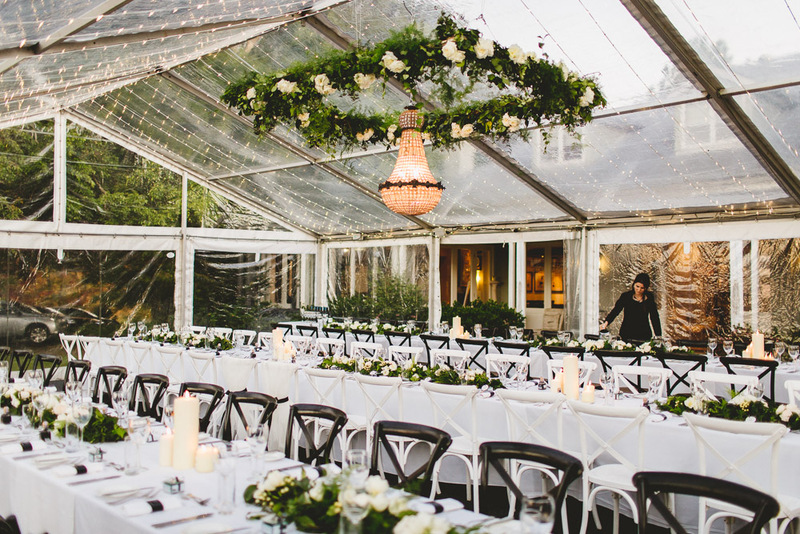 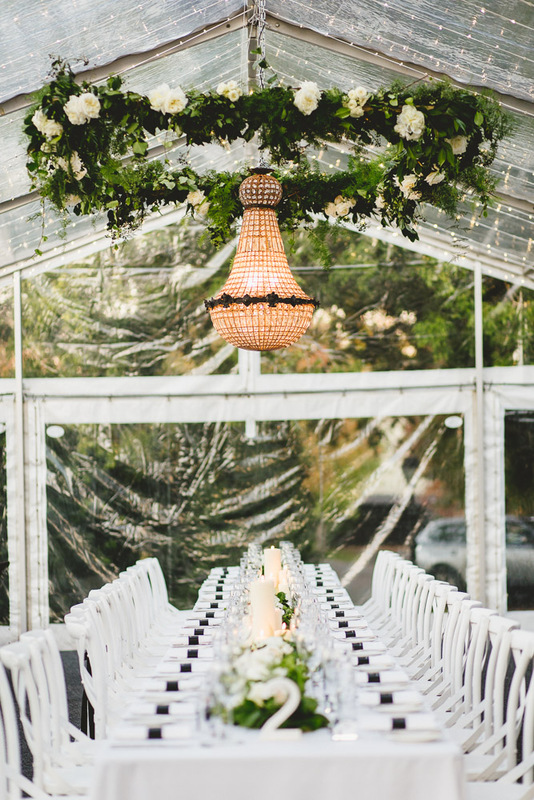 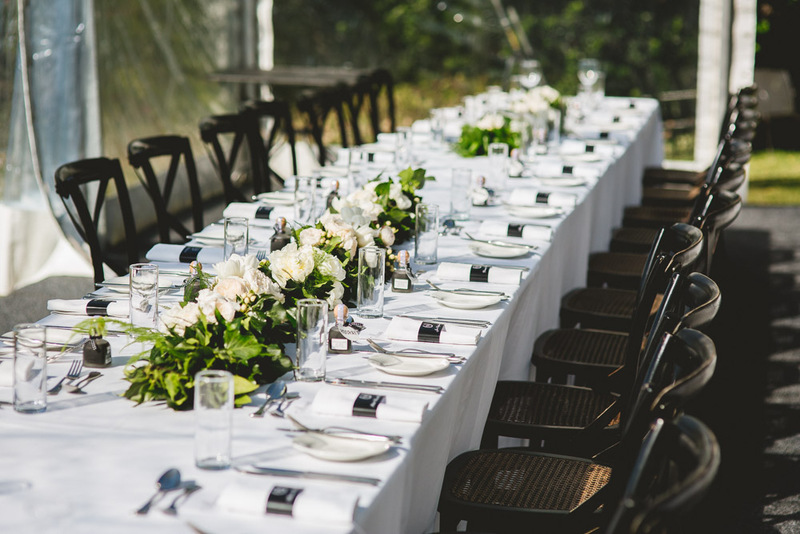 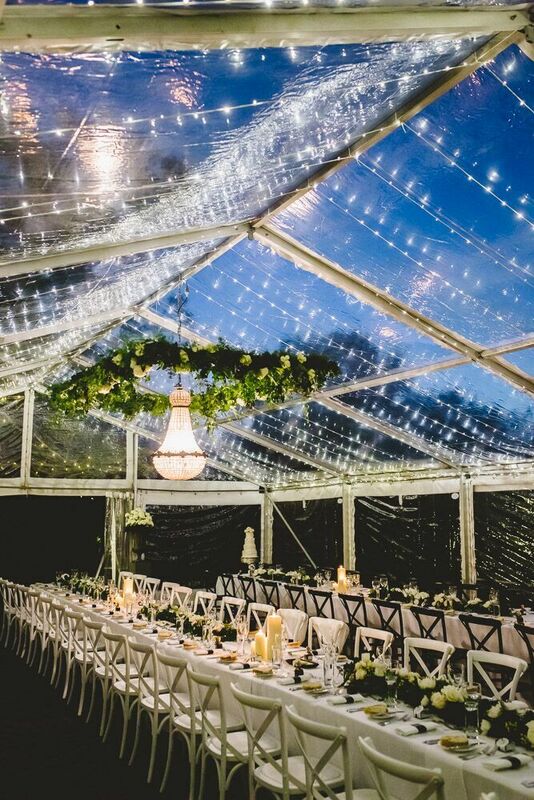 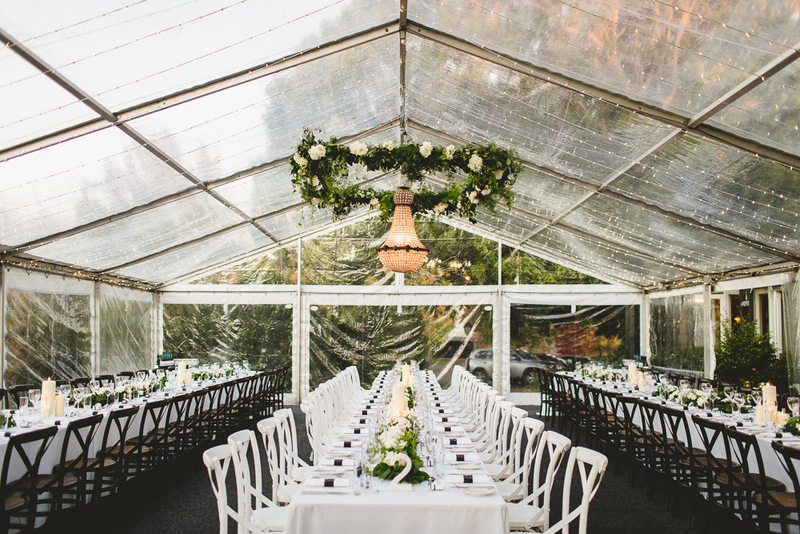 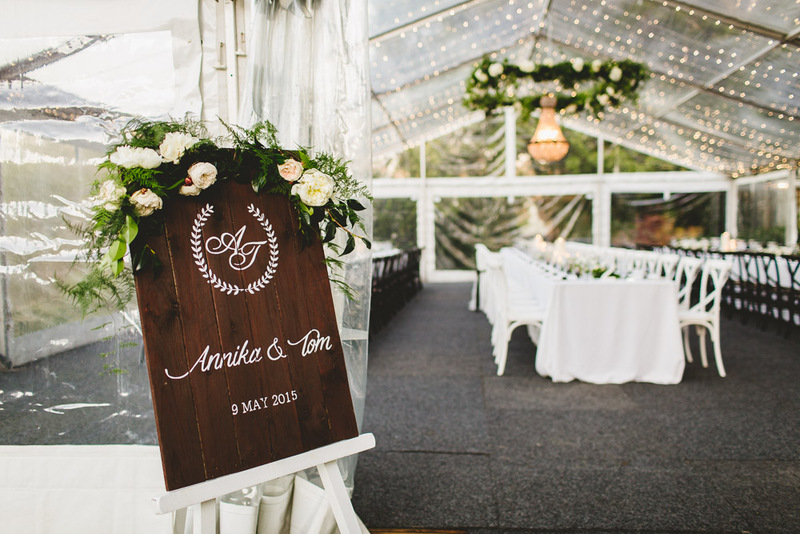 The reception celebrations held at Spicers Clovelly Estate were held under a beautifully lit clear marquee. 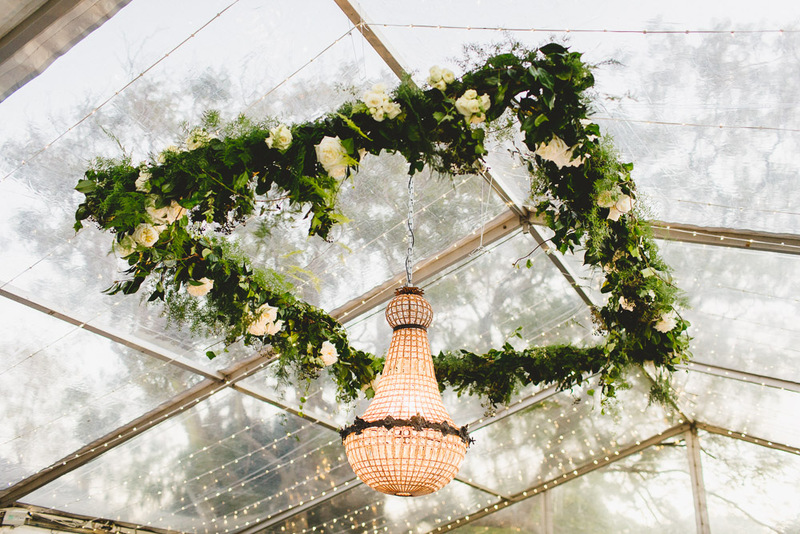 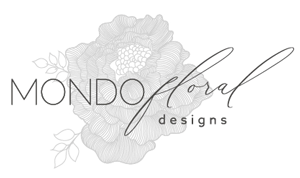 We created a hanging floral installation that hung high from above, featuring white roses, peonies and lush gradenesque greenery accents, and the hanging floral installation framed that gorgeous chandelier from Lovebird Weddings. 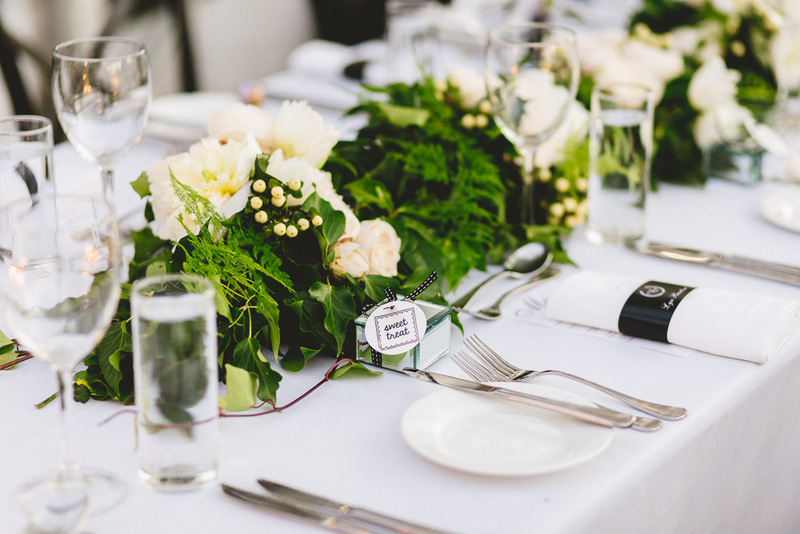 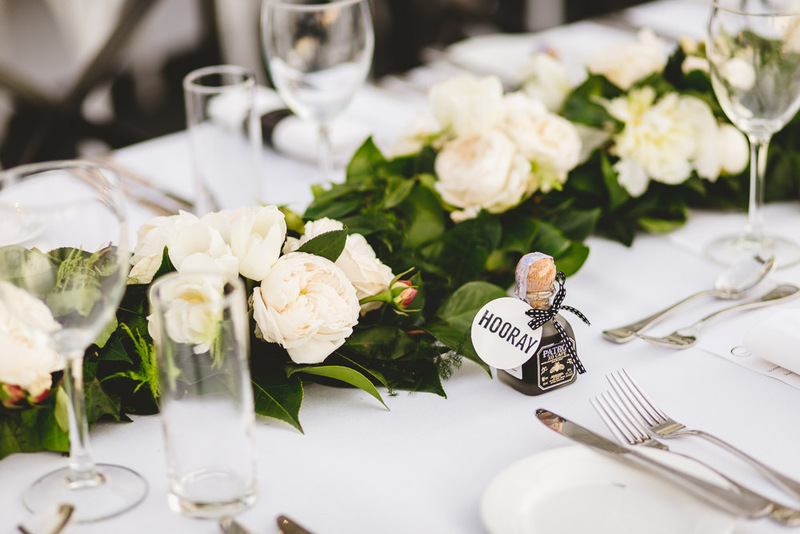 The beautiful reception tables featured multiple longer style garlands with gorgeous David Austin roses and pops of pretty berries, the stunning florals were accented by clusters of candles in between and pretty table decor also styled the beautiful dining space. 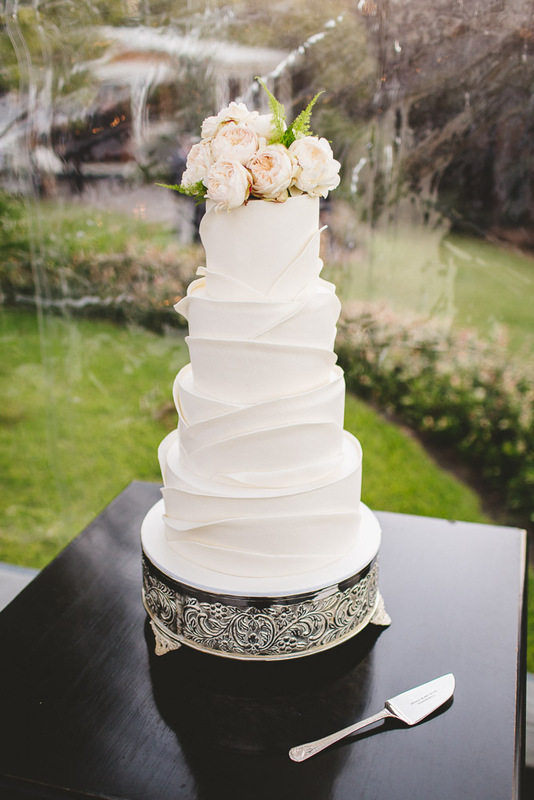 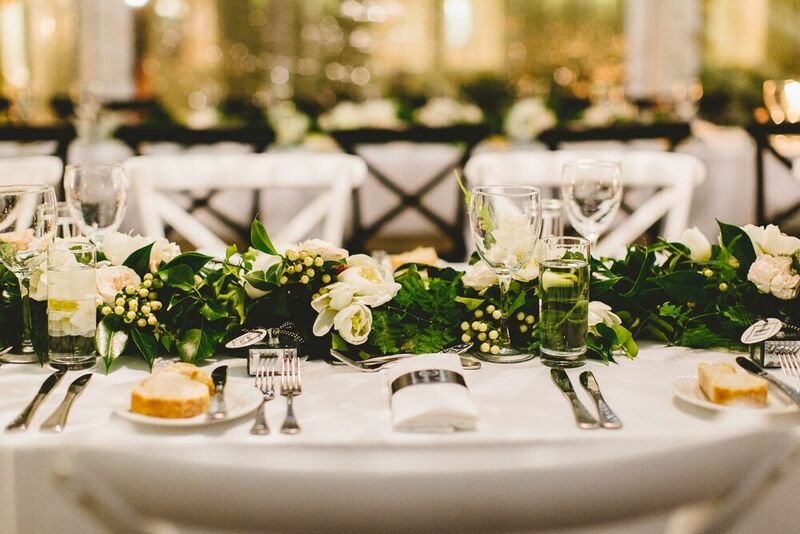 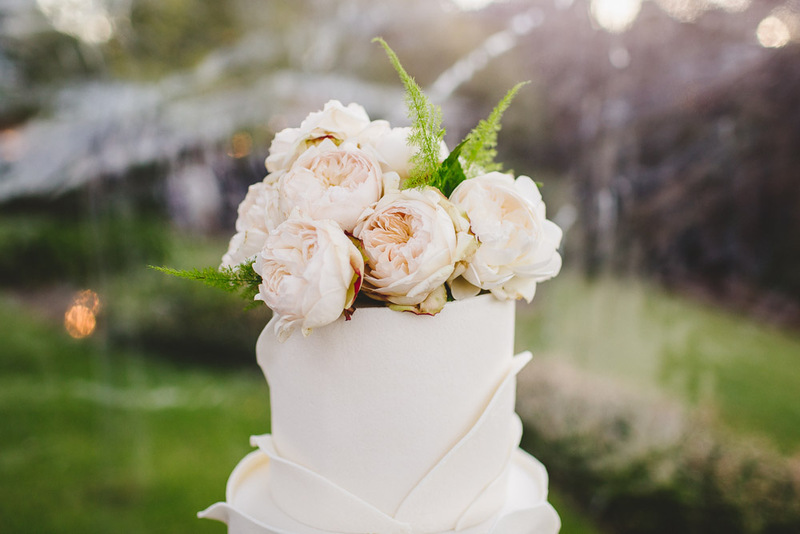 The wedding cake by Cake Designs also featured David Austin roses and touches of lush green. 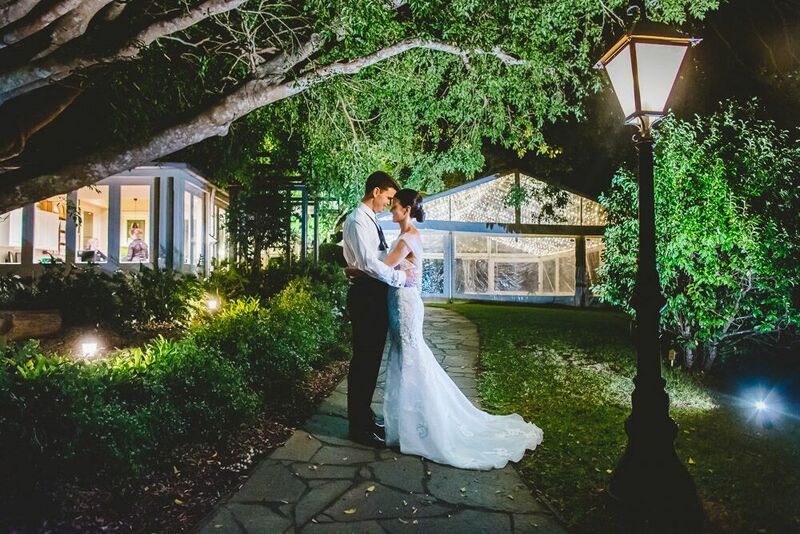 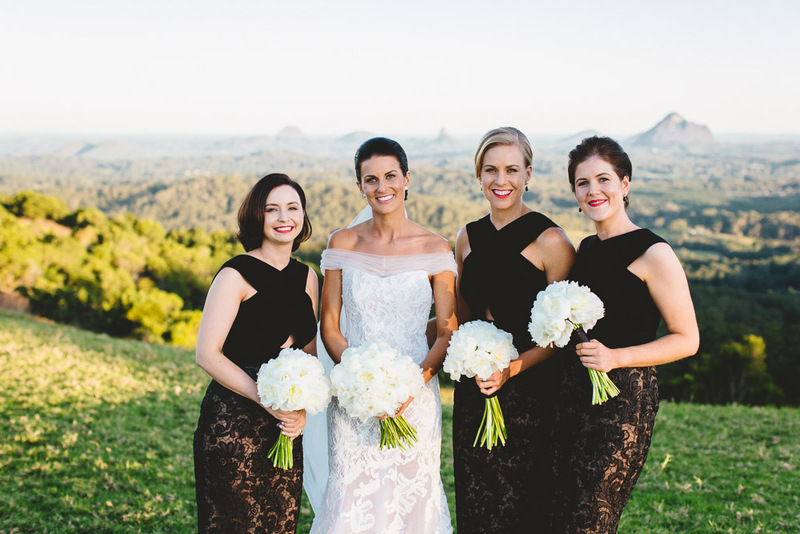 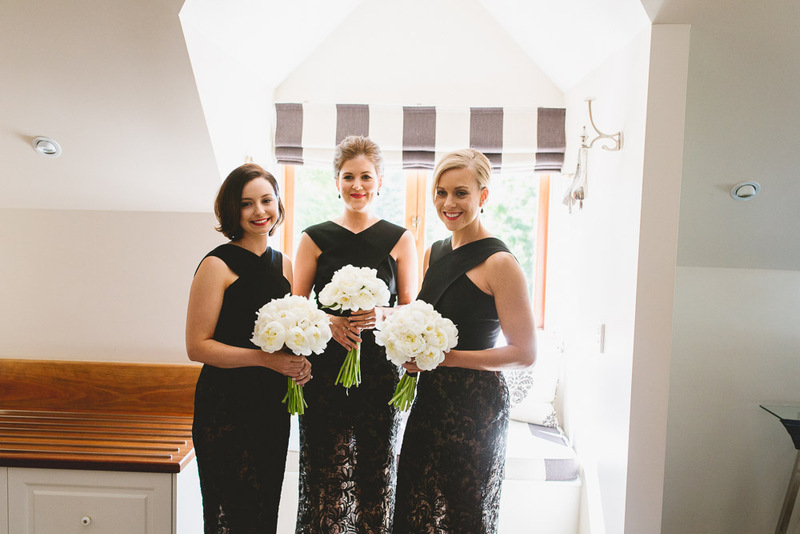 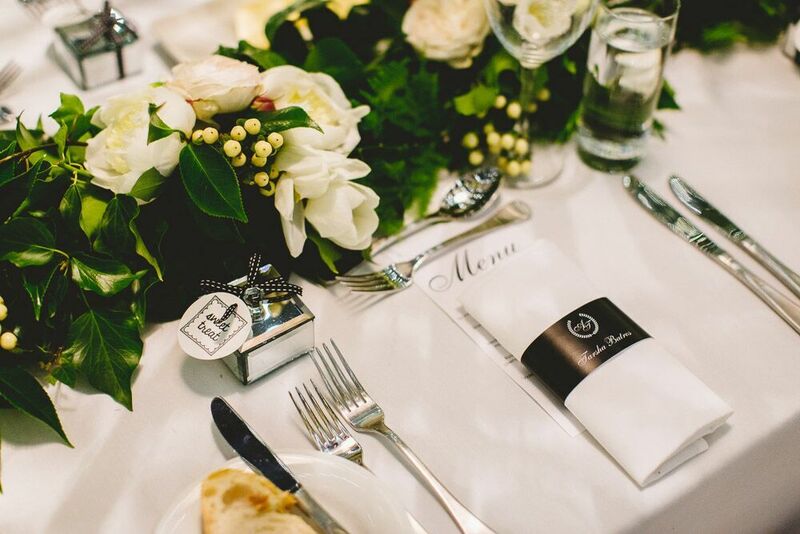 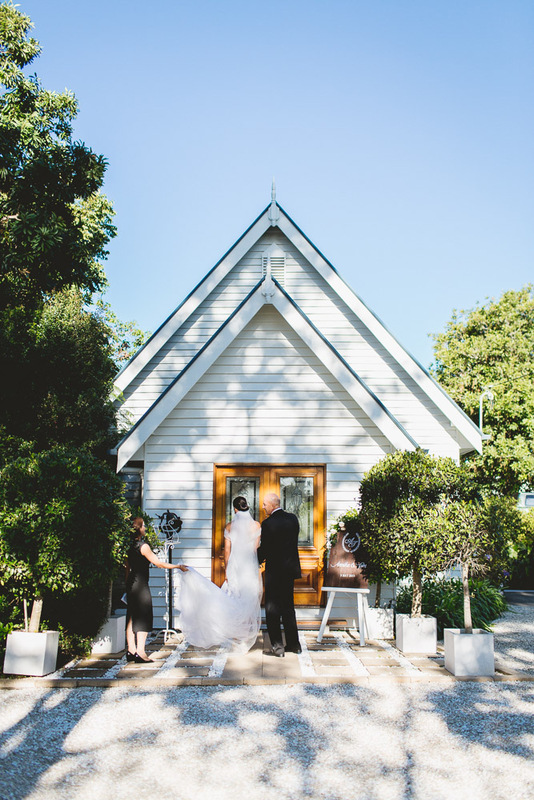 It was a fairytale setting, and in the evening the sparkle of the pretty lights, and the surrounds of the beautiful property added that extra touch of romance and glamour to the beautifully styled space.